“Ryan is often sought out by seniors and peers alike for counsel regarding policy, operations, district morale, and interpersonal relation issues. Ryan somehow always has his “finger on the pulse” of the district membership. He is reliable, honest, and caring, while providing thoughtful, heartfelt mentorship and advice regarding a variety of matters ranging from personal life issues with individual members, to “30,000 foot perspectives” regarding labor and management topics. I am always amazed at how often Ryan can bring things into perspective when the world seems to be on fire for individual members. 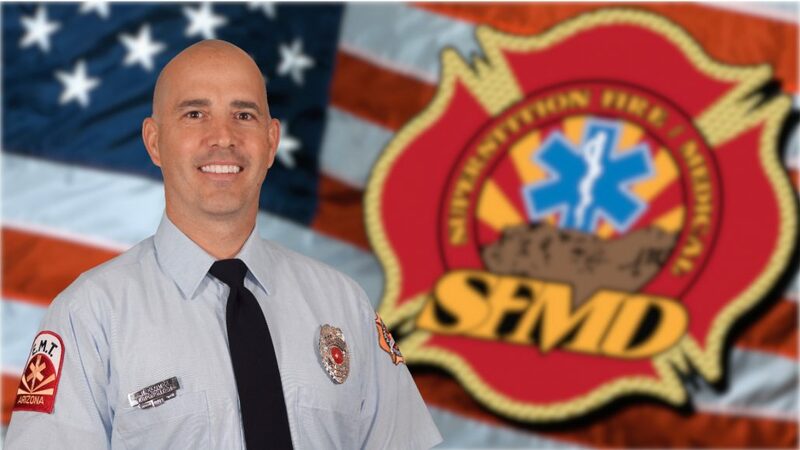 I believe Ryan is playing an instrumental role in the culture change occurring in the SFMD as we strive to be the premier fire district in the state. Ryan teaches us to love one-another, seek out non-biased facts, problem solve, set aside our ego, and be the best humans we can be (both on and off duty). Ryan sets an example for us to follow. Ryan is experienced, both technically and tactically proficient on the fireground and EMS scene, but it is his words and actions between calls, around the dinner table and off-duty which sets him apart and further defines his character. A Firefighter/EMT, Ryan was recently certified as a Technical Rescue Technician, and is assigned to Station 262. Ryan is a proud member of a newly created Peer Support Team, various committees, and is a certified Blue Card incident commander. Born and raised in California, Ryan lives in Mesa with his beautiful wife Robbin (of 16 years) and their 3 amazing boys; 13 year old Ty, 11 year old Greyson, and 7 year old Rush. Ryan currently oversees the youth and men’s groups at his local church, and is also actively involved in a local Boy Scout program. “I’m honored to receive such a prestigious award, and extremely thankful for the support of my peers and the SFMD” said Ryan Elowe. Please join the Superstition Fire & Medical District in congratulating Ryan Elowe as our 2016 Firefighter of the Year!